I-522 set records for campaign spending, with agrichemical and food processing companies from around the country contributing more than $33 million to efforts to defeat the measure, while organic food and natural supplement companies both in- and out-of-state spent more than $9 million to get it on the ballot and approved by voters. Washington voters signaled they are leery of requiring labels on genetically modified foods, satisfied with their century-old initiative process and have mixed advice for the Legislature on taxes. Initiative 522, which would have required many foods and beverages that contain genetically modified ingredients sold in Washington to carry labels, was trailing Tuesday night by more than 95,000 votes and appeared headed for defeat. The campaign set records for spending on a ballot measure in Washington. Agrichemical and food processing companies from around the country contributed more than $33 million to efforts to defeat the measure, while organic food and natural supplement companies both in- and out-of-state spent more than $9 million to get it on the ballot and urge voter approval. Supporters easily gathered the required signatures and had huge leads in early polls, but opponents painted the measure as confusing, poorly written and likely to raise the cost of food for consumers. 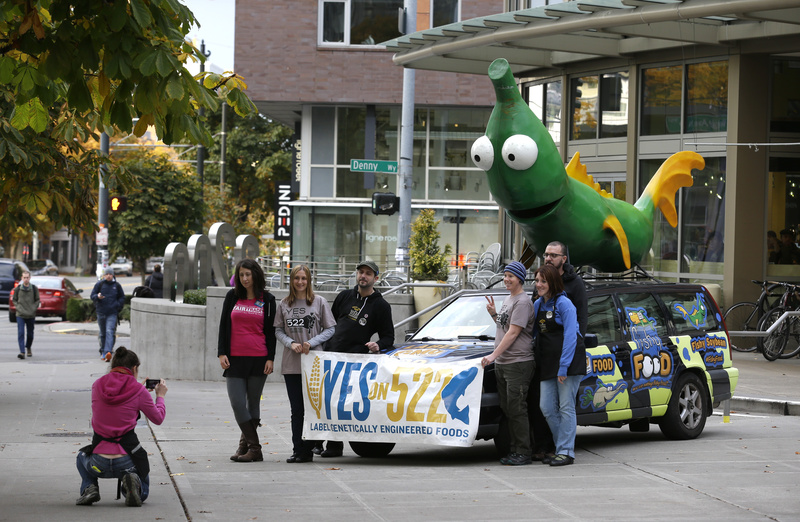 Supporters tried a last-minute ad blitz that suggested the measure could protect the salmon industry from genetically engineered “frankenfish,” but opponents countered that state law already requires labeling on fish. I-517, an initiative about initiatives, failed by an even bigger margin, with 60 percent of the votes counted Tuesday night marked “no.” It proposed some significant changes to the state’s century-old method of allowing voters to pass laws the Legislature won’t, or repeal laws that legislators approved. It would have lengthened the amount of time petitioners had to collect signatures to a full year, up from six months, protected them from harassment and allowed them to get signatures in certain public places like shopping malls. The measure was opposed by a wide range of current and former state officials, business groups and labor unions. Andrew Villeneuve, of the Northwest Progressive Institute and a leader of the No on I-517 campaign, called it an effort to manipulate the initiatives to make money and give petitioners special privileges. “The rejection of I-517 is a victory for the initiative process over the initiative business,” Villeneuve said in a news release after it was clear the measure was going down. Tim Eyman, author of the proposal and a regular sponsor of ballot measures, insisted the current process favors “the big guys” who can spend money to qualify their initiatives. “That’s too bad,” Eyman said. “The initiative process should be available to everyone,” he said in a news release. Five advisory votes designed to give legislators a barometer of the public’s view of taxes that were raised or extended earlier this year were providing mixed results Tuesday night. By narrow margins, voters were saying the repeal of a tax credit for people who lease publicly owned property and a new excise tax levied on small commuter air carriers should be maintained. A tax on some pediatric dental services and the end of a sales tax exemption for some landline telephone services should be repealed. The advice was almost evenly split for the extension of the state estate tax on estates of more than $4 million. Legislators are not bound by the votes, and the taxes are unlikely to be repealed, regardless of the final vote counts.